Tallmadge, OH – Local business and finance writer and entrepreneur Tiffany C. Wright of Tallmadge will debut her book, The Funding Is Out There! 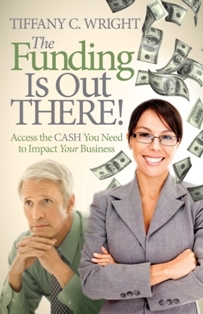 Access the Cash You Need to Impact Your Business, as part of a multi-author book signing event at Barnes and Noble in Akron at 4015 Medina Road on Saturday, November 22 from 1-4 pm. Tiffany C. Wright, is the founder of The Resourceful CEO, which provides small and medium business owners with the productized services, training and tools they need to achieve higher business cash flow and profitability. In addition, she is a former business consultant and serial entrepreneur who has advised a number of businesses over the years. Tiffany has been featured on radio and podcasts and brings humor, passion, and creativity to her work. Tiffany continued, “I am excited to be launching The Funding Is Out There! at Barnes and Noble in Akron. I grew up in the Akron area so Akron will always be near and dear to my heart. I’d love for business owners and aspiring entrepreneurs to stop by and ask me any questions they may have regarding business funding. I love to help people achieve their dreams.” Tiffany will be available for book signings and questions from 1-4 pm on Saturday, November 22, at Barnes and Noble in Fairlawn.